Every investor aspires to make money in stocks irrespective of their experience. Indian stock market is growing day by day. You need to have a smart strategy so that you can make great returns and protect one’s money. Everybody is well known with the stock trading and stock investment but only a few smart people know how to earn money from the stock market. Like in the current scenario, the equity benchmark Sensex is fluttering around its lifetime high, but most stocks are in the negative route on a year-to-date basis. When in a confusing state, one should never hesitate to take the guidance of professional advisers or experts for managing your portfolio. 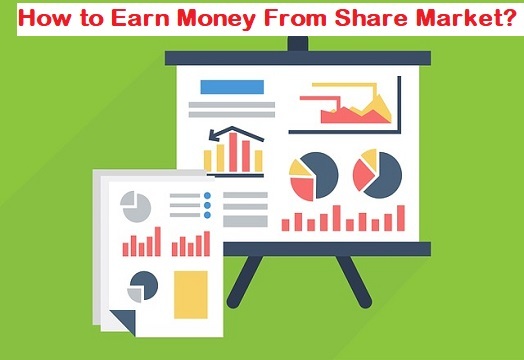 Our today’s post is centered on how to make money from share market. There is consistent growth in investment, as there is huge money inflow in the market. As an investor, the question that strikes in our mind is how to make money from share market? Right? or What are the ways to invest in the share market? Stay tuned for this post to know what are those ways to earn money from trading and other best investment plans. So, without much ado, let get going. How to Earn Money from Stocks? How to Earn Money through Trading? Firstly, there are two types of things one can do in the stock market first is an investment and another one is trading. Investment is a great option for those who are seeking long-term investment. There are pools of stocks that have provided 100% to 50000% returns in the last 10 years. If we throw light to the past 2 years, there are hundreds of shares which have risen more than 100% in the last year. It is aptly stated that buy such stocks that you can hold forever! Yes, practicing long-term investment is key. Yes, if you trade in stocks like a pro-investor then chances are high that you generate greater profits. You can buy fundamental stocks at a low price and go for long-term for better returns. check best books for stock market. You must be thorough with the performance of the share market. Buy a good stock at the right place, and hold it for the long term. Investors approach is more real and logical. All you need to do is generate a portfolio of shares that can generate a decent return over the long term on a consistent basis. If you are someone who is passionate about buying and selling of shares on a regular basis then I must say trading is for you. It is to remember trading has chances of big gains and a big loss. Trading in stocks is not an easy affair. Do not jump on buying the stocks instead study the know about of share do the thorough analysis first. Therefore, never invests in something that you don’t understand or find ambiguous. The advice here is quite obvious that do not invest in the temptation of becoming rich. Risk comes from not aware of what you doing. Now, let us learn how to earn money from share market. Yes, an investor will get income in the form of dividends. A company distributes the profit by declaring partial or full dividends. The dividends are distributed per share. If a company decides to give Rs 10 per share, and if the face value of the share is Rs 10, it is called a 100 percent dividend. By investing in shares you can make money with capital appreciation. The gains from shares can go as high as 100 % or more. There is no guarantee for capital appreciation. In the former securities are issued and subsequently listed on the stock exchanges. A public issue introduced in the primary market can be of two kinds-an Initial Public Offering (IPO), or a follow-on public offering (FPO). An IPO is used when an unlisted company wants to raise equity capital by issuing shares. It results in the company’s shares getting listed on a stock exchange. In an FPO, a listed company issues shares to the public. It can be either a fresh issue or an offer for sale. For Smart investment put your money in different stocks, which is also called diversification. Putting all your funds in single stock may not the right thing to do. For beginners, it is suggested to stick to large-cap stocks which mostly consist of an index. Investor let us now learn a few pro tips for investment in share market. Yes, investment is indeed a sensitive decision it should not be taken under influence of peers, friends or relatives. You must not invest in the stock just because others are pouring down their money in it. Study the company in which you are investing. It is suggested to invest in the asset class in which you have sound knowledge and take time to learn about what you don’t. It is to note down investors that no asset class is going to pay exceptionally high bonus for a long time. By this, I mean you must have the updated knowledge of the company events and track regular news of that company. As you all know the investment is a sensitive decision, therefore, it is advised to pool in only the funds which you have as surplus. The equity market is volatile there is always uncertainty or temporary loss. As an investor, it is prudent to invest systematically and with patience. As an investor, you should be ready to absorb calculated risk and decide a required course of action like hedging against underlying stocks. Last, but not least, by diversifying a portfolio across asset class, you would be able to minimize risk and earn optimum returns. I hope you had a great time reading about How to make money from share market. If you love reading us please like and subscribe us. Also, if you have any queries pertaining to this post you may write to us. Investing in the stock market is simple, but not easy. It needs passion, patience, and discipline. I am elated to share my knowledge about How to earn money through share market? with you. I hope that this post has been of valuable assistance. Have a wonderful day & all the best for future endeavors. Thanks for sparing your valuable time for reading.